THE BOTTOM – The success in establishing Saba DOET was done by “making the link last year with a project that we did under the Saba Lion’s Club, via the SXM DOET that gave us a little bit more insight and at least a contact to Oranjefonds to continue”, stated Carl Buncamper Coordinating Member of Saba DOET. March 15 and 16 was Saba’s first time participating independently within the largest volunteering events in the Dutch Kingdom, NL DOET, with 110 signed volunteers assisting in 14 different projects including the painting of fences, compost bin upgrades, beautification, bike repairs, and coastal clean-up. The participants were very diverse in specific with the youths as well as persons in their middle ages and old folks who were physically able. Surprisingly, persons who didn’t live on the island also contributed since they admired Saba. Vernisha Robinson playing bingo with the elderly. “With last year versus this year, there wasn’t too much of a difference. 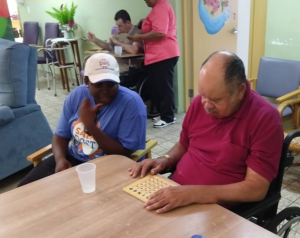 Last year we did a painting of Ms. Zager’s house and this year, I contributed by playing Bingo with the elderly and the painting of the Eugenius Johnson Center”, said volunteer Vernisha Robinson. “We are grateful for the input from Oranjefonds particularly on a financial level because many times people are willing to do stuff, but finances may be holding them back to get basic products. In this case, for example, most projects were able to qualify for $650 towards each individual project,” ended Buncamper. Saba will be looking forward to a stronger participation in the DOET program next year.